I say this because the writings collected in the “Old Testament”, as most Christians call it, have no clearly stated completion or resolution. They have no literary denouement. Instead, the Old Testament ends in expectation, awaiting a fuller revelation to usher in a new kingdom and its Messiah. The Old Testament presents a history of redemption and promise, a “salvation-history” (Heilsgeschichte). But as one scholar has pointed out, it is a salvation-history that never actually arrives at salvation (John Bright, 1959). It creates a trajectory that doesn’t quite arrive at its termination point within its own pages. In the history of religion, there are only two possible answers to this question—the one offered by Judaism and the one offered by Christianity. Judaism believes the truth-claims of the Old Testament were preserved in the Pharisaic traditions of the Mishnah (approximately 200 AD) and, finally, in the Talmud (commentary on the Mishnah). In this approach the culmination of Old Testament hopes and expectations is deferred to the future. The Messiah’s arrival is still a future event, and the kingdom of God is postponed. On the other hand, Christianity has been clear from its inception that the New Testament fulfills and complements the Old. The genealogies of Jesus in the Gospels (Mt 1:1–16; Lk 3:23–28) explicitly affirmed that the Messiah has arrived, and that he is the culmination and fulfillment of the Old Testament prophecies. Over and over again in the New Testament, the authors emphasize the intimate connections between the events of their day and the Old Testament with quotes such as “All this took place to fulfill what had been spoken by the Lord through the prophet . . .” (Mt 1:22; see also Lk 24:44–47). And the early church recognized and affirmed the importance of the Old Testament to Christian faith, rejecting all dissenting voices as heretical, such as Marcion of Sinope. The arrangement of Old Testament books in our Christian canon intentionally ties Old and New together. By concluding with the prophets, the Old Testament collection leaves off with a final prediction of that day when one greater than David will appear (Mal 3:1). But this raises one of the thorniest questions of reading the Bible: How do the Old and New Testaments relate to each other? Some today would say the Old Testament does not relate to modern culture; indeed, even many Christians cut it from their Bibles, either intentionally or by neglect. In recent years, intense debates have centered on this very question, in both the US and Germany. Here, leading pastors have suggested that portions of the Bible (many of which are Old Testament texts) should be placed in a category of passages that never fully expressed the heart, character, or will of God. Another pastor has proposed that modern Christians should ‘unhitch’ from the Old Testament altogether (see here for similar debates happening at the same time in Germany, although much more academic). What should our response be? With the earliest Christian believers we must assert that the Old Testament is God’s Word for our times! The question is not whether we should read both Testaments, but rather how we should read them together. Exactly how do they relate? We must define this relationship as more than a simple promise–fulfillment connection, since much of the Old Testament is something other than promises. Likewise, it is more than a simple chronological sequence, as the terms “old” and “new”, or “first testament” and “second testament” might imply. This is not an old, outmoded covenant system now made obsolete by a newer, sleeker model. Instead, the relationship is more integrative and reciprocal. There is an interdependence between the Old and New Testaments. Reading either testament in isolation from the other will result in misunderstanding both. Or, as theologian Fredrick Holmgren said it, either testament “without the other cannot be the scripture of the church” (The Old Testament and the Significance of Jesus, 1999, 138). This intimate relationship between the Testaments has at least three aspects. First, the Old Testament is the literary background for the New. This can be illustrated by the sheer mass of New Testament quotations of or allusions to the Old. One scholar has counted 295 explicit references to the Old Testament, occupying some 352 verses of the New. But the literary relationship is more than mere quotations. 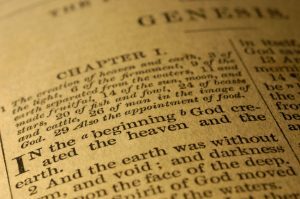 The rhetorical techniques, and to some degree even language and style of the New Testament authors, are shaped by the Old Testament. Second, the Old Testament is the historical foundation of the New. It is no exaggeration to say the New Testament would be incomprehensible without the historical information of the Old. How would readers of the New Testament understand the claim that Jesus of Nazareth is the Messiah without first learning something about the history of national Israel and the Davidic dynasty? This historical interdependency could be illustrated in countless ways. But perhaps the most obvious is the New Testament’s claim to fulfill the Old Testament’s future hopes. Third, the Old Testament is the theological centerpiece of the New. The authors of the New Testament begin by affirming the theological truths of the Old, and they assume their readers know those truths and accept them. In fact, most of the great doctrinal truths of the church are defined first, not in the New Testament, but in the Old. Furthermore, many of these truths are not defined at all in the New Testament; they are simply taken for granted. So for example, the significance of creation, the nature of anthropology (or the human condition), the consequences of human sin, the central role of covenant in redemption, the doctrine of atonement—all are given definitive statement in the Old Testament and assumed by the authors of the New. And this is only a partial list. In many ways, the New Testament contains little that is actually new, but rather describes the climactic fulfillment of the theological themes and messages from the Old Testament. Austrian Bible scholar, Ludger Schwienhorts-Schönberger puts it this way: “The often-posed question of why the Old Testament belongs to the (Christian) Bible should really be – if it were asked in a historically and hermeneutically correct way – ‘Why does the New Testament belong to the Bible?’” (“Marcion on the Elbe: A Defense of the Old Testament as Christian Scripture,” First Things [December, 2018]: 21-26). In these ways, and in many others, the Old Testament is the literary, historical, and theological matrix of the New Testament. So I return to that intimately personal question the Old Testament poses for every reader: “Since God claims to reveal himself in the Old Testament and promises to reveal himself further in the future, what do I make of these theological claims?” The New Testament and two thousand years of church history have affirmed with one voice: Jesus Christ is the fulfillment of that Old Testament revelation. Together the truth-claims of the Old and New Testaments give us pause to consider restating the question. Perhaps we should ask, not what do I make of the claims of the Bible, but what do they make of me? The Bible offers truth, and invites all of us to receive, confess, believe, and allow the text to form us (not just inform us but to transform us). In so doing, these writings become the means of grace whereby God’s Spirit makes us new people. Dr. Bill T. Arnold is Paul S. Amos Professor of Old Testament Interpretation at Asbury Theological Seminary and a WCA Council member. This article is excerpted and revised from his “Epilogue,” in Encountering the Old Testament; A Christian Survey, by Bill T. Arnold and Bryan E. Beyer, Third Edition (Grand Rapids, MI: Baker Academic, 2015), 467-69.